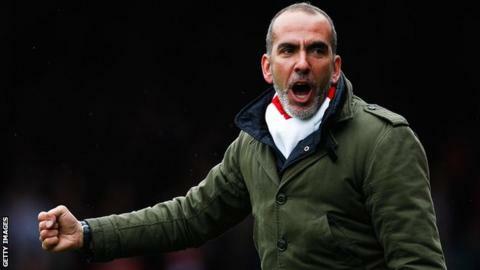 Former Swindon Town manager Paolo Di Canio is considering suing the club for an alleged breach of contract. BBC Wiltshire understands the Italian wants to take legal action because of the sale of Matt Ritchie to Bournemouth for £500,000 in January. Di Canio claims the winger was sold behind his back, which he says breaks a clause in his deal. The club told the BBC they would not be commenting. The 44-year-old quit the League One promotion chasers on 18 February. He cited Ritchie's departure as the main reason for his exit. At the time, Swindon said the sale of the former Portsmouth midfielder to their top-six rivals was necessary because of Town's precarious financial situation. Swindon's then owner Andrew Black had put the club up for sale and stopped investing any more money, leaving the County Ground outfit on the verge of administration. A consortium - fronted by Banbury chairman Jed McCrory - agreed a deal to buy the club on 30 January but it took until 21 February for it to be approved by the Football League. With the club desperate for immediate funds, they accepted an offer from Bournemouth for Ritchie and he was sold. Di Canio said he only became aware of the deal when Ritchie informed him about his imminent departure. When approached by BBC Wiltshire, the club were not willing to comment on the matter, but new chairman McCrory later told the Swindon Advertiser he would be "disappointed" if legal action was taken. Former Celtic, Sheffield Wednesday and West Ham striker Di Canio had a successful 21-month tenure at Swindon - leading them to the League Two title last season, as well as the Johnstone's Paint Trophy final. New manager Kevin MacDonald, 52, was appointed as Di Canio's replacement on Thursday. Swindon currently sit fourth in League One, three points off the top spot.